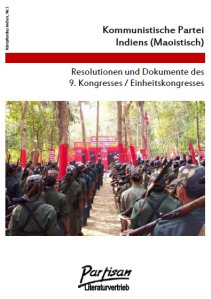 on behalf of the Alliance against Imperialist Aggression (BGIA, in German) we welcome all participants of the conference; everyone who was involved in the preparation of this conference; and all comrades who cannot be here personally due to logistic limits and difficulties but who, through their various contributions, have helped to make sure that we can fulfill this important task today. This conference is a demonstration, and a lively expression of Proletarian Internationalism, an expression of militant anti-imperialism. Comrades, what we are doing now is not a “solidarity meeting”, not a formal ritual designed to flatter the hypocritical philanthropists. NO! We are here because we are fighting. We are here to advance our anti-imperialist and revolutionary work. We are here to unite in our concrete political and moral support for the Indian people, for the people’s war, which it is developing under the leadership of the CPI (Maoist). We are here because we are part of that same struggle, because we too want to bury every kind of exploitation and oppression. Comrades, for us this meeting is a declaration of war, a beginning of a new stage of our work. This has to be expressed through a leap in our anti-imperialist activity, organization and co-ordination. 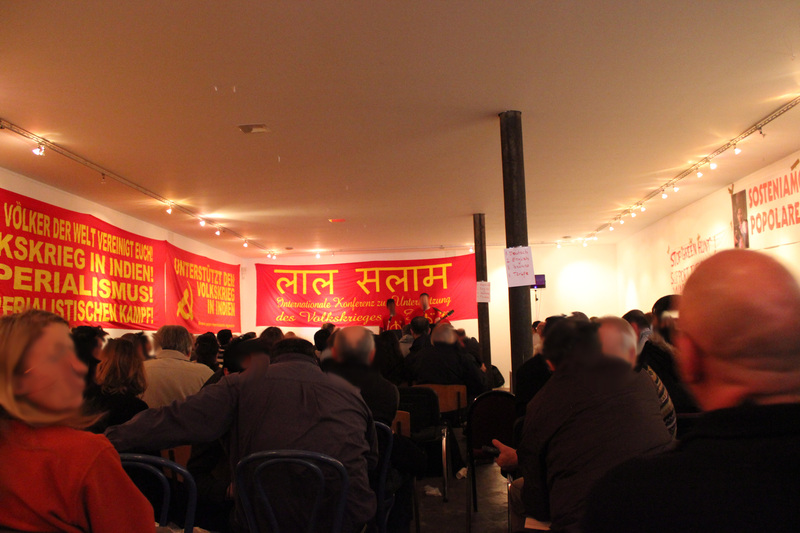 We, an alliance, consisting of organizations, groups and individuals, who have anti-imperialism as their common ground, but with different ideological and political starting points in many other questions have accepted this conference as an important task, because of our evaluation of the role of the people’s war in India within the world-wide anti-imperialist struggle. Now we want to why explain we find this struggle in India so important. We think that what we wrote is correct. A presentation likes this makes sure that one understands how the world is today. It makes sure that one understands that the main contradiction on world level is the contradiction between imperialism and oppressed nations. This contradiction is far from getting softer, on the contrary it is intensifying. The whole history of the last years confirm this. This presentation also makes sure one understands that there are two more contradictions which are fundamental: the one between proletariat and bourgeoisie and the inter-imperialist contradiction. For us, this enumeration lists the contradictions in the order of their importance. The contradiction between oppressed nations on the one hand and the imperialist super-powers and powers on the other hand is the main contradiction. That is due to the weight of the masses in history. The huge majority of the masses on Earth lives in the oppressed nations. Also, it’s clear that these populations are growing much faster than the populations in the imperialist countries. That is the tendency that is shown by history: the weight of the masses in history. And additionally it is becoming clear that through this struggle that is fought in the oppressed nations, imperialism is subverted and perishes more and more. That is why we think that what we are saying about the main contradiction is very important. There are those who do not think like we do and they think that we do not believe in revolution in the imperialist countries. That is wrong. We think that these revolutions are a historical necessity and the development of the main contradiction makes the conditions for them more favourable. These revolutions will happen, because they are a necessity. After all, it is a fact that for the revolution to be able to win in the whole world, two big forces, two big revolutions, have to come together: the democratic revolution and the socialist revolution. Without them, imperialism and the reaction cannot be swept away from Earth. In order to subvert imperialism it is a strategic necessity for the world revolution to unite the national liberation movement with the struggle of the international proletarian movement, and to advance the revolution. Although the slogan of the communists is “Workers of the world, unite!”, the slogan that is leading the common struggle of these two forces must be: “Workers and oppressed peoples of the world, unite!” Those who are not seeing the huge importance of the national liberation movements for the world revolution cannot develop any activity that is going beyond petty-bourgeois radicalism, at “best”. In view of the importance of the oppressed nations in the struggle against the imperialist system it is necessary to have a clear picture of the forces who act there. Without seeing the class character, that every party, organization or movement has, without seeing how they proceed, which aims they say they have and how they act practically, it is impossible to take a correct standpoint which concretely helps the progress of the anti-imperialist movement. The key question is the world-view they are following, the ideological and political line. Every form of resistance against imperialist aggression is justified, but if the struggle of resistance is not led by a world-view which corresponds to the interests of those most oppressed, then all efforts and enormous sacrifices will be in vain. History is full of examples for that. In order to show that, it is enough to take a look at the Afghan resistance against the imperialist aggression of the USSR. After “islamists” had taken possession of the resistance, they ended up as puppets in the hands of the Yankees and later on they had to fight their own masters. The ideological and political lines of the anti-imperialist parties, organizations and movements result in the forms of organization and struggle they use. As consistent anti-imperialists we do not just oppose certain expressions of the system but we want bury the system as a whole. And we are very aware that you have to put an end to exploitation in order to definitely achieve that. For this you need the communist party, which applies the revolutionary war to the concrete circumstances in every country. This is what we have in India: justified ideological and political line, communist party and people’s war. In a country with a population of more than 1.2 billion, almost a fifth of the world population. A semi-colonial and semi-feudal country in which capitalism is developing. A country with a huge impact in the centre of the storm of the world revolution: the oppressed countries of Asia, Africa and Latin America. So what? Does not all that lead to the conclusion that this struggle is of huge importance for the anti-imperialist struggle? “To imagine that social revolution is conceivable without revolts by small nations in the colonies and in Europe, without revolutionary outbursts by a section of the petty bourgeoisie with all its prejudices, without a movement of the politically non-conscious proletarian and semi-proletarian masses against oppression by the landowners, the church, and the monarchy, against national oppression, etc. – to imagine all this is to repudiate social revolution. So one army lines up in one place and says, “We are for socialism”, and another, somewhere else and says, “We are for imperialism”, and that will he a social revolution! Only those who hold such a ridiculously pedantic view could vilify the Irish rebellion by calling it a “putsch”. It follows from this that our process, the world-wide anti-imperialist struggle, will not be “pure”, either. Some people would use this as an argument to deny that it is necessary that the communist parties take their leading roles. We don’t. Precisely because of the complexity of the struggle, to correctly handle the diverse contradictions, the leadership of the communist parties is all the more necessary. The creative and innovative way in which the CPI (Maoist) is able to handle the immense diversity of the contradictions in India – caste, cultural, national etc. contradictions – and the way in which this party fights for the unification with the people’s war of all these various struggles of the oppressed in the country is an example that the highest attention should be given to. This is the case because the perspective on world-level is the same: the wars of liberation and resistance have to merge with the revolutionary wars to become a storm that wipes away imperialism. Over the last decades imperialism has succeeded in neutralizing or “pacifying”, how they cynically call it, many anti-imperialist struggles through the trick of “peace agreements” (which includes the whole idle talk of “negotiations” and “cease-fires”). All those “peace agreements” of the last twenty years – from South Africa to Nepal – where the insurgents have de facto given up for a lentil dish confirm that the people can expect only more oppression and exploitation from that. In this regard it is important to highlight those parties, organizations and movements who hold up high the banner of the anti-imperialist struggle. This has the purpose of drawing the line against opportunism. For this it is important to stress – and we are fully justified in doing so, not just because our argument is correct but rather because we are connected to the very same realities of the struggle – that the main threat for every party, organization and movement comes from the question what the outcome of the struggles within them is. The deep truth that this phase – the castle has to be taken from within – is expressing has been confirmed countless times. Therefore, to support the people’s war in India is drawing a line of demarcation against opportunism, against the national capitulation (in the oppressed nations) and class-wise capitulation. Anti-imperialism is not “international solidarity” when buying coffee, organizing meetings to “support the poor victims over there”, or being inspired by the “mysterious orient” or all those other ridiculous things. NO! Anti-imperialism is a struggle, on all levels, by all means, to bury the bloodiest system humanity has ever seen, to end millennia of exploitation and oppression. For this reason we have the duty to ourselves to support each other in every respect. This is not a question of following after someone and not a question of taking a narrow-minded and pedantic stance, but a question of a true unity of all combatants. So the faint-hearted “sceptics” are wrong right from the start, saying “all those struggles, Nepal and so on, ended in betrayal … that’s why the work to support India is not worth it, because we know how it’s going to end.” They take a stance that shows that for them it is about “those there and us here”. This has got nothing to do with Proletarian Internationalism but is the attitude of the universal misanthropy of petty-bourgeois know-it-alls. This is the attitude of those who have already lost the battle, of those who have no other prospect than their own decay. This attitude is the expression of a lack of trust in the masses. We, on the contrary, come from what was already said by Marx and Engels at their time, namely that there are two forces on Earth: the armed power of the reaction and the unorganized masses. What is to be done is to organize those masses. Like this, what is possible becomes an acting reality and the possible becomes true. Everything remains a daydream if one is not anchored in the masses, and the problem is to get from unorganized masses to militarily organized masses. The oppressed scream for the organization of the rebellion. In the case that a party, organization or movement betrays the masses, the task is to resume and continue the way. The history of the peoples has always been like this: fight, fail, fight again and so on, until victory. At the same, when we stress the necessity to break with capitulation in form of “peace agreements”, now it is indispensable to denounce those playing “anti-imperialists” but who refuse to support or even oppose the just struggle of the Indian people. Let alone the miserable attacks of the friends of the social-fascists of the “CPI (Marxist)” and other enemies of the people. Those people dream of living in the times when they received their orders from Moscow, when they defended the imperialist aggression against Afghanistan, and they dream of replacing the struggle of the peoples with “geo-politics”. That’s why they don’t hesitate calling the butchers of the Iranian people anti-imperialists or salute the alleged “anti-imperialist” stance of imperialist states like Russia. What they have in mind is exchanging the just defense of the right to national independence for the support of interests of other imperialists. They don’t assume that the oppressed countries are semi-colonies and that the regimes in those countries don’t represent the national interests (those regimes don’t represent the national bourgeoisie but are agents of imperialism). Those denying the semi-colonial (or in certain cases colonial) character of the oppressed countries in the end just follow other imperialists. These alleged “anti-imperialist positions” are nothing else than pro-imperialism. So it’s no wonder that they don’t support the people’s war in India. Another version of the same story are those people who are for example able to demonstrate against the aggression against Palestine, side-by-side with the Grey Wolves, but who find it impossible to make a statement in support of the people’s war because they fear infection with “dangerous” Maoism. People with this kind of character are not only pathetic but they are lacking any internationalist spirit. “Neither we nor anyone else can calculate precisely what portion of the proletariat is following and will follow the social-chauvinists and opportunists. This will be revealed only by the struggle, it will be definitely decided only by the socialist revolution. But we know for certain that the “defenders of the fatherland” in the imperialist war represent only a minority. And it is therefore our duty, if we wish to remain socialists to go down lower and deeper, to the real masses; this is the whole meaning and the whole purport of the struggle against opportunism. By exposing the fact that the opportunists and social-chauvinists are in reality betraying and selling the interests of the masses, that they are defending the temporary privileges of a minority of the workers, that they are the vehicles of bourgeois ideas and influences, that they are really allies and agents of the bourgeoisie, we teach the masses to appreciate their true political interests, to fight for socialism and for the revolution through all the long and painful vicissitudes of imperialist wars and imperialist armistices. Like this our efforts to support the people’s war in India serve to draw a diving-line against opportunism and to strengthen the anti-imperialist movement. Let us now come to concrete measures. 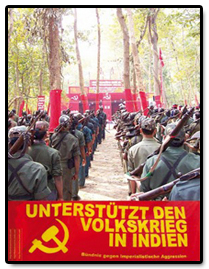 Let the people’s war in India become part of the core of the anti-imperialist movement! When we carried out the activities in support of the people’s war in India our prior impressions were confirmed, that there is utter ignorance of the fact that in that country there is a powerful revolutionary movement, including among those forces close to us. In some cases, comrades with whom we work together on a daily basis have surprised us with their lack of knowledge. Naturally if this is the case, we cannot expect the working class and the masses of the people in general in the GDR to be aware of this. Therefore the immediate task is to spread information, about its current situation and its perspectives, to make propaganda for the people’s war. The problem with spreading information is that we need propagandists who know the topic very well and who are able to pass on information; but because of the lack of trust-worthy information in German the number of comrades who are able to do this remains limited. The main point for us is the political consciousness of the activists. We are convinced that today’s conference, as well as the preparation of it serves to raise and popularize this consciousness among our own comrades and friends. That’s why we believe we are now able to make a leap concerning the problem of translating information. Already, important initiatives in this direction have been taken, for example by the proposals of the comrades from Austria. Now we call on all comrades and friends who are able help with the task of translations to get in touch with us so that we can divide and systemize the work. At the same time a platform for publishing and sharing the translated material is necessary. 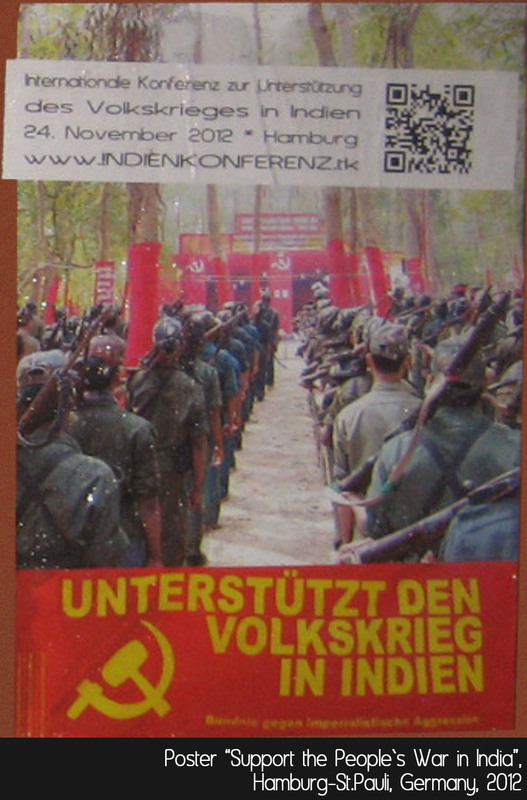 We propose to transform the website that we have used to mobilize for this conference into a German-language information portal about the people’s war in India. So we also call on those interested to get in touch with us in this regard. We expect to be able to initiate these two things, translations and website, immediately. 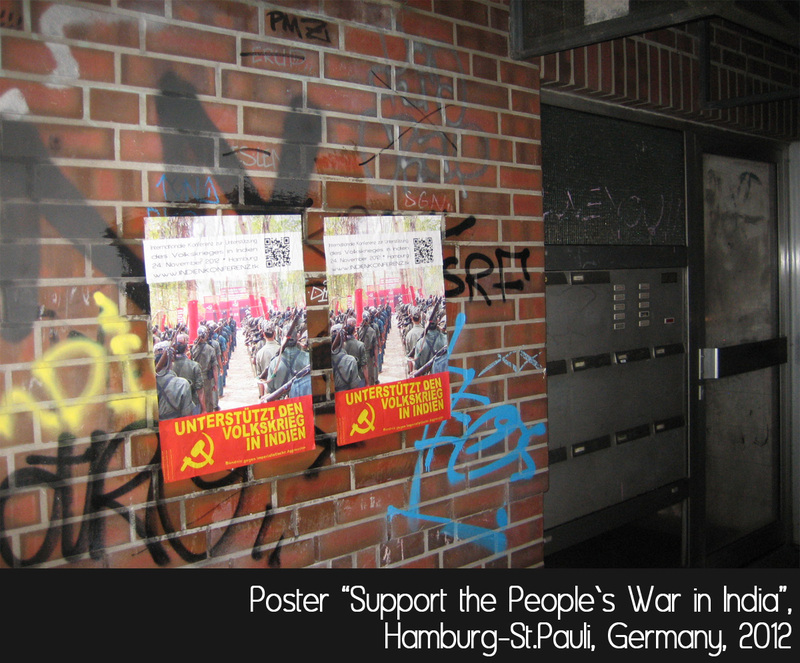 We call for the creation of groups in support of the people’s war in India in different German cities, be it independent groups or “working groups” of existing structures. We believe that right now it is not appropriate to build a centralized structure. The website can take over the function of co-ordination. We emphasize that we do not want the work in support of the people’s war in India to isolate itself or to develop disconnectedly from the anti-imperialist movement in general, but we want it to become part of the core of the anti-imperialist movement itself, inseparably connected to the support of other revolutionary and anti-imperialist struggles in the world. 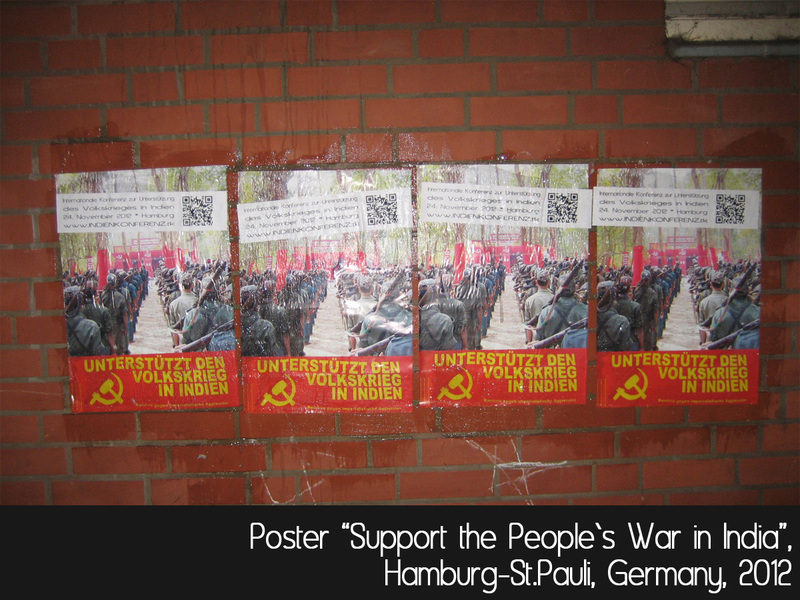 The authorities in Hamburg have called 2012 the “year of India”. The infamous “Hafengeburtstag”, the port birthday was dedicated to India and in October, Hamburg mayor Olaf Scholz visited India to “develop trade relations [that is, stealing of wealth]”. Because the interest of the rulers in this city is so big Hamburg has had its own agency in India since 2005. We too have a big interest in India. But we won’t open offices there. What we have to do is open our own “agencies”, but not for “trade” but for informing about the revolutionary reality of the people’s war. To conclude we want to remind you that while we are here, right now, our comrades in India are fighting a life-or-death struggle against imperialism and its lackeys. Sacrifices are big and they are being made for the liberation of humanity from the imperialist yoke by those most oppressed, those most exploited. Those killed in action are uncountable, but as a symbol for them, today we want commemorate Comrade Kishenji, an important leader of the CPI (Maoist), who was killed a year ago today. We commemorate those killed in the revolutionary wars and anti-imperialist struggles. We commemorate them in our struggle. They urge us to double our efforts to advance the anti-imperialist struggle on world-level. Workers and peoples of the world, unite! Long live the People’s War in India! Forwards in the anti-imperialist struggle! 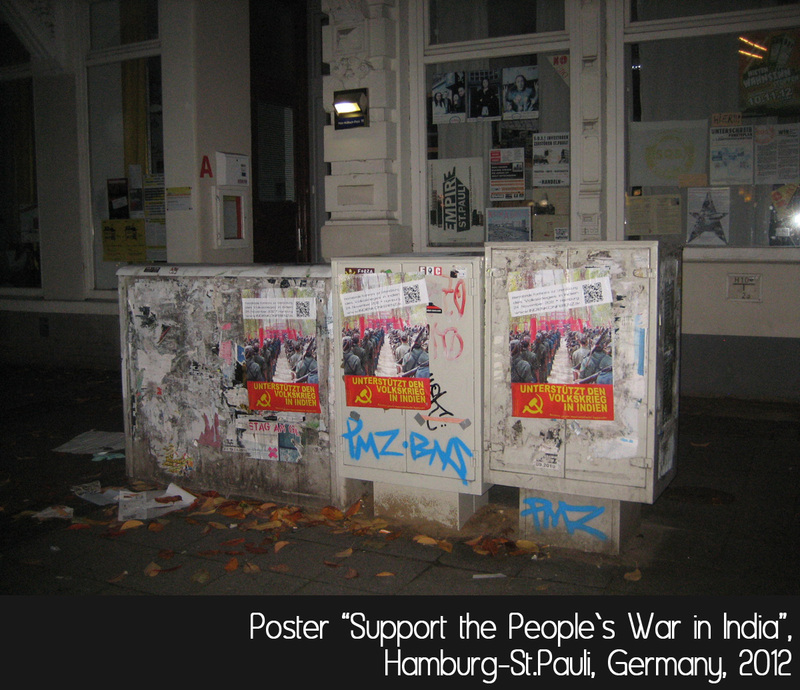 On the 24th of November the International Conference in Support of the People`s War in India took place in the city of Hamburg, Germany. 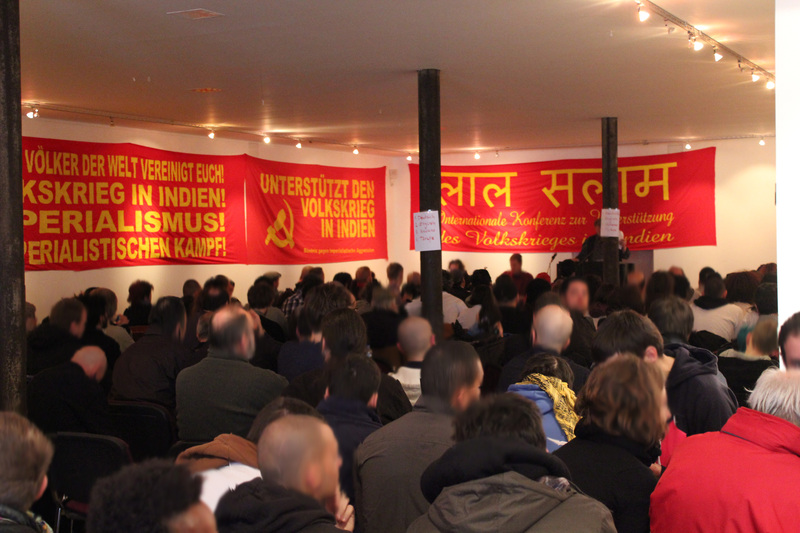 Following the joint Call of the International Committee to Support of the People`s War in India and the Hamburg based League against Imperialist Aggression, internationalists form different parts of the world came together to exchange views on who to develop the international work in support of the struggle of the Indian people against imperialism, semi-feudalism and bureaucratic capitalism. Delegations, organizations and individuals from Afghanistan, Austria, Brazil, Canada, Columbia, France, Galizia, Germany, Holland, Iran, Italy, Kurdistan, Norway, Palestine, Peru, Philippines, Spain, Sri Lanka, Sweden, Switzerland, Turkey, the United Kingdom and many other countries participated in the Conference. Some 300 hundred persons attended the event. 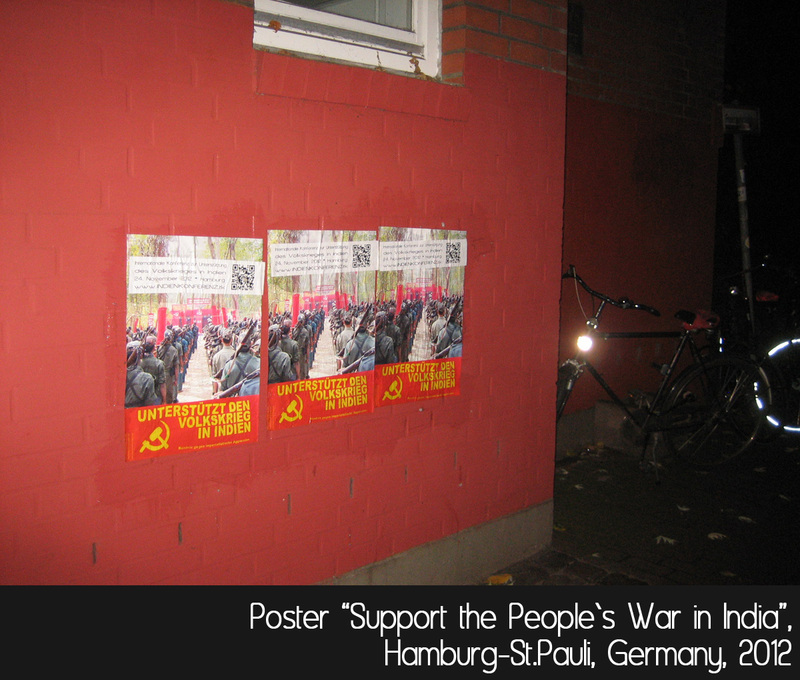 On the same webpage pictures from the Conference as well as information of the preparatory campaign – including the official video of mobilization, the graffiti paintings, posters and so forth – can be seen. The Conference also contained a cultural program with music groups preformed Swedish folk music, German Rap and Revolutionary songs in Turkish, all in a profound anti-imperialist spirit. An important statement was made by a Palestinian comrade, who pointed out who the struggle of the Indian people are linked to the resistance against the murderous Zionist Occupiers and their Yankee-imperialist masters. At the end of the speak slogans in support of the heroic Palestinian people resounded the hall. The organizers of the Conference stated a strong condemnation of the barbaric attacks on the population of Gaza. Another important feature of the Conference was the great number of youth who participated, not only as participants but also as part of the organizing structures. This aspect, together with the truly internationalist character of the event, gave it a very vivid and dynamic character. 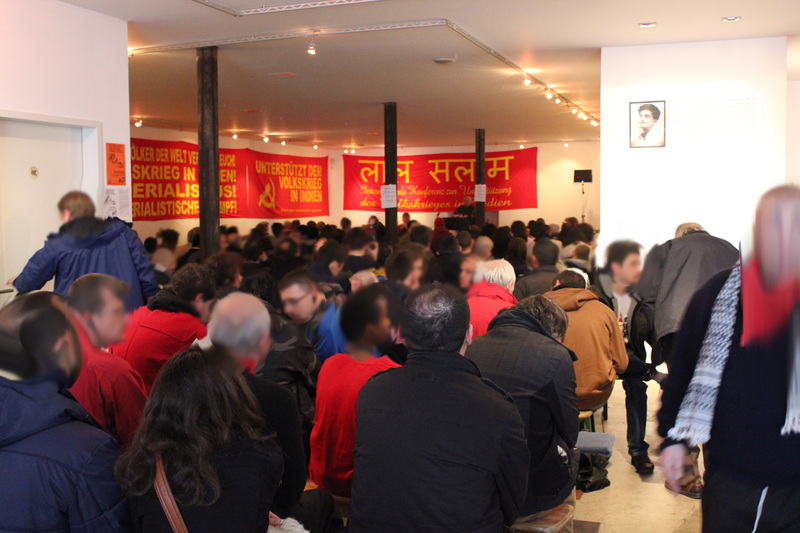 After the official part of the program delegates and participants continued to celebrate and long into the night revolutionary songs in many different languages and anti-imperialist, militant antifascist and communist slogans made the tune of a rejoicing feast of internationalism. As a result of the Conference concrete steps have been made in the Coordination of the forces who support the People`s War in India. This without a doubt will have very real impact on the international work and lead to a stronger international campaign. We stand with our comrades in India! 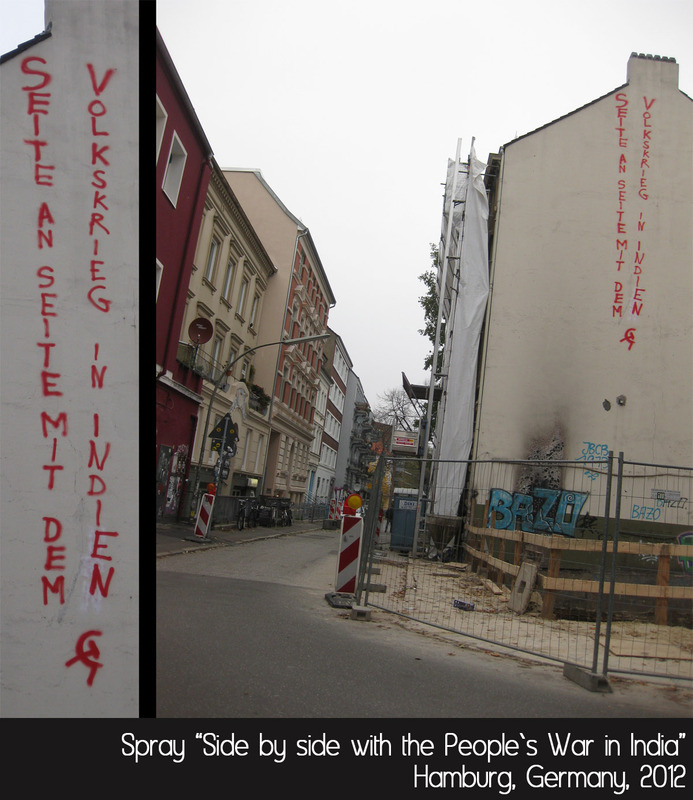 Victory to the People`s War! Du browst gerade in den Indienkonferenz Weblog-Archiven.